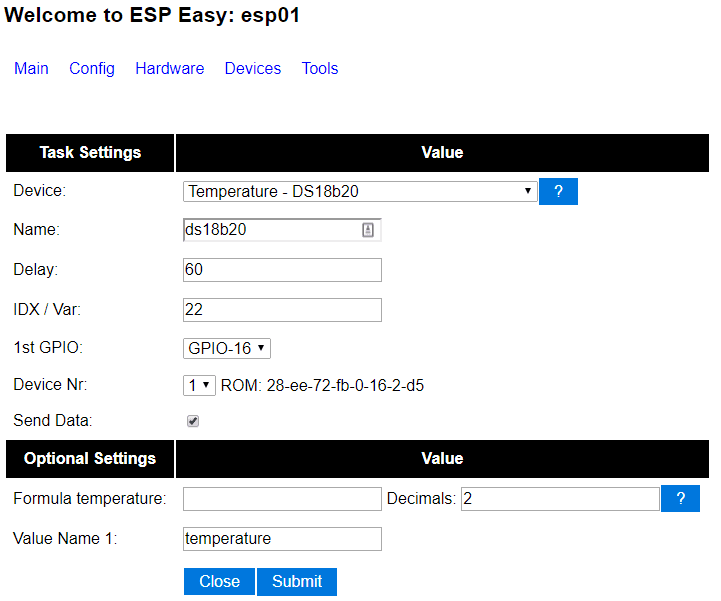 I've got an ESPEasy device (NodeMCU) with a DS18B20 and DHT11. Everything is working properly, besides the resolution of the DS18B20. The readings I get in the interface are 1°C apart from each other. I would like to change the resolution, but the web interface does not have this option. I remember that older version do have this option. GPIO16 is not very optimal choice for this. So resolution can be limited by ESPEasy firmware. I didn't know that, thanks for the info. I've changed to GPIO14 (D5). Sensors works fine again, but still in 9bit mode. And I can't find any option to change this setting. R120 is really old. If you need better resolution you need to upgrade to newer versions. Ok, that's a bit weird though that it is recommended on the start page as the stable version, while better versions are available. But I'll try a newer version then, thanks. It's still the official stable but since then we (TD-er and myself) have taken over the project and we're working for a new stable. Ah, clear. Thanks a lot for building this! I appreciate it a lot! PS. If all is working well, I'll send a donation in your direction. Currently running ESPEasy_v2.0-20180322, but I've also used 2.0.0 dev11. With both versions I can set DS18B20 to 12 bit, but after a hard reboot it is back at 9 bit. (with a soft reboot it stays at 12 with 20180322. It would be nice if it would stay at 12bit even after a hard reboot. Is it a bug or a feature? Kept my promise Keep up the good work! Happy with how easy it was to add a MH-Z19 to the unit. I have got six Sonoffs basic with V2.0-20180322. Power failure occurs 4x per day and the resolution is still12bit. Do you press "submit" button after changing resolution ? Yeah, i do. It is working just fine at 12bit, until a hard reboot.